As expected, the five-day Zhuhai Air Show that took place from November 6 until 11 was accompanied by a shameless display of China’s export ready weapon systems. This year’s installment had a few surprises aside from the familiar draws–killer drones and stealth fighters–and one remarkable piece of kit that didn’t quite get enough attention was the SR5. The rocket artillery system from Norinco is a 6×6 truck mounting a twin-cell launcher designed for modular payloads. It needs to be clarified whatever is shown at the Zhuhai Air Show isn’t meant for the PLA. Curious delegates from every corner of the world are its target audience and the hardware on sale is getting better and better each year. Take note of the C705 cruise missile lying between the 220mm and 610mm munitions. Via Chinese state media. The SR5 has been a fixture in Norinco’s marketing efforts at arms shows for a while now but even after Zhuhai 2018 no orders from abroad have leaked. This is a sign Norinco’s brand hasn’t transcended the company’s reputation as an armorer for rogue states and its latest products still don’t attract the same curiosity as their rivals from Russia or the US. It’s too bad since the SR5 is superior to most rocket artillery systems available for export. This is because Norinco is willing to supply several kinds of munitions for it. Aside from standard Grad rockets packaged in 20-round modules the SR5 accepts 220mm rockets with a maximum range of 120 kilometers. 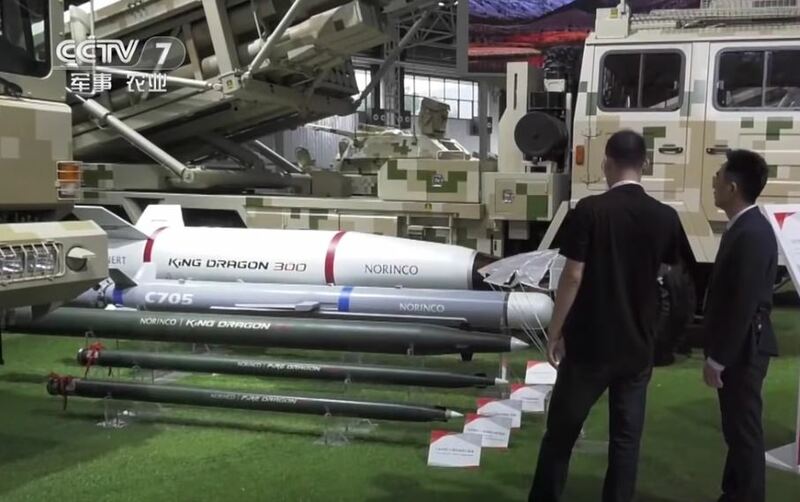 If precision is the name of the game, Norinco offer a ground-launched C705 cruise missile for high value targets nearly 200 km away. This is aside from the King Dragon 300 that’s best used for crippling the enemy’s infrastructure and various sensitive locations. 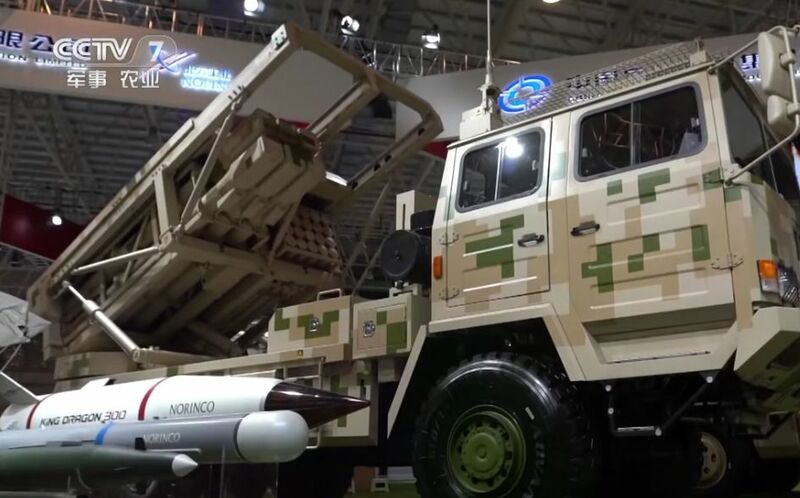 In what can only be a deliberate attempt at blue ocean marketing, which is finding a niche that doesn’t exist yet, Norinco have a smaller SR7 rocket artillery system based on a proven multirole armored truck in a 6×6 configuration. The SR7 mounts a 20-round launcher for 122mm Grad rockets and the entire vehicle is small enough for medium transport aircraft. Central Asia – Each of the -stans have ordered Chinese weapons in the past decade. At the rate Turkmenistan is throwing money at its pint-sized armed forces, it isn’t difficult to imagine the SR5 rolling in Ashgabat soon. Eastern Europe – With Belarus already converted to a loyal customer, the SR5 is a fine replacement for its leftover BM-21’s. Besides, the SR5’s modular armaments makes it superior to the Uragan and the Smerch. Serbia may come up with a lookalike of the SR5. 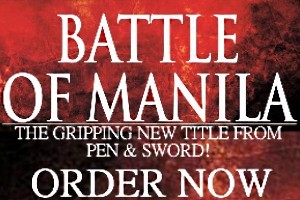 Southeast Asia – Cambodia, Myanmar, and Thailand are dependable patrons of Chinese armaments. Thailand in particular has adopted a long-range 300mm artillery system and should it go looking for a short-to-medium-range solution, the SR5 is a fine choice. Myanmar, on the other hand, already deploys Norinco’s 122mm Type 90B…so why not complement it with the SR5? Middle East/North Africa – Regardless of the US’ enthusiasm for supplying its would-be “Arab NATO” with all the weapons its members need, many Gulf states do buy Chinese. So does Algeria, Egypt, Iraq, Jordan, Lebanon, Morocco, Sudan, and Syria. Turkey loves Chinese rocket artillery. In short, MENA is a great place to sell weapons! Central and Southern Africa – The countries in the region can only afford modest quantities of Chinese arms. But if Tanzania or Uganda need to upgrade their armies’ firepower, the SR5 is a huge leap forward.